The beagle is joyful, friendly, gentle and playful, and makes a wonderful family pet. He is an affectionate yet calm dog who loves everyone, and is excellent with children and with others dogs. He needs to be raised as a puppy with non-dog pets in order to get along with them. He loves company, and although at first reserved with strangers will quickly warm up to them. This makes him only a moderately good watchdog, since he will bark for a stranger at the door, but then quickly make friends! He loves the outdoors, but shouldn't be left alone in a fenced yard. He can bark and howl when lonely. It's better to keep him inside when you're away from home. He loves to roam and to sniff. He doesn't have a doggy odor like some breeds and he doesn't drool. For walks, he should be kept on a leash to avoid his sniffing and running off to hunt after interesting smells. Because of his energy and stamina he makes a great walking, jogging, and hiking companion. He can be single-minded about his sniffing, and a bit stubborn, and therefore is difficult to train. He can also be hard to housebreak, a little slow to catch on at first. He loves to sniff out food, so it's best not leave food sitting unattended on a countertop. He can live in the city or in the country, and in an apartment without a yard if walked daily. He is a medium shedder so he will leave quite a bit of hair around your home. The beagle is 13 to 16 inches tall (to shoulders) and weighs 18 to 35 pounds. He has a short, coarse coat. His coat usually consists of two or three colors, and can be made up of black, tan, white, or red. His dead hair falls out naturally. With his short, easy-care coat the Beagle only requires the occasional brushing. However, if you want to minimize shedding around the home you may find yourself brushing him for 5 to 10 minutes a couple of times each week. The beagle's exact origins are not known, but beagle-related dogs can be traced back to hounds that existed during Roman times. The modern beagle was developed in England in the 1830's out of several other hound breeds, and was used for chasing rabbits. The first Beagle Club was formed in England in 1890. 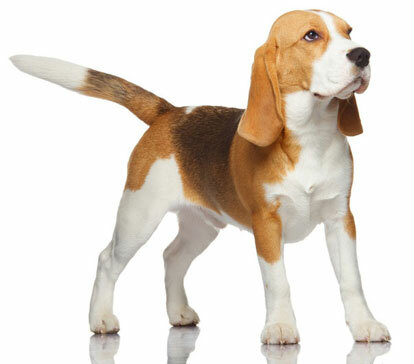 In the 1840's, the beagle arrived in America, and was recognized by the AKC in 1884. His AKC popularity was 5th out of 157 breeds in 2007.